If you're looking for the perfect place to take your next vacation, why not escape to this relaxing Bondville, Vermont getaway? This vacation rental offers a wonderful outdoor patio area with a private hot tub and room for up to eight! Located just five miles from Bondville, this quiet and remote getaway is perfect for escaping the stresses of everyday life and enjoying wonderful natural surroundings. An open living room, dining room, and kitchen area offers exposed beam ceilings, hardwood floors, and plenty of warm places to curl up and relax. Sit on the large sectional sofa, enjoying the warmth from the fireplace and a few of your favorite books, or watching something on the cable-equipped flatscreen TV. Bring your laptops - WiFi is also offered for free! If you don't want to bring your laptop, you can use the desktop computer in the home. The kitchen has stainless steel appliances, sparkling granite countertops, and a large dining table where you can gather around and enjoy the meal. There's even a wet bar for mixing up your very own drinks! Four bedrooms, four full bathrooms, and one half-bathroom can accommodate eight guests comfortably, with a maximum of six adults. Sleep on the first floor in the master suite with an en suite bathroom, a second bedroom with a double bed, or the third with a sleeper sofa. Upstairs, there's another bedroom with a double-size bed and its own bathroom. An additional bonus basement area has a Ping-Pong table, two queen-size air mattresses, and another full bathroom. Other amenities include a private washer/dryer, a fireplace, and a jetted tub. Spend your time out on the deck, soaking up the sun or cooking burgers on the gas grill. Plenty of seating is available outdoors, and you'll even have a firepit to roast s'mores! 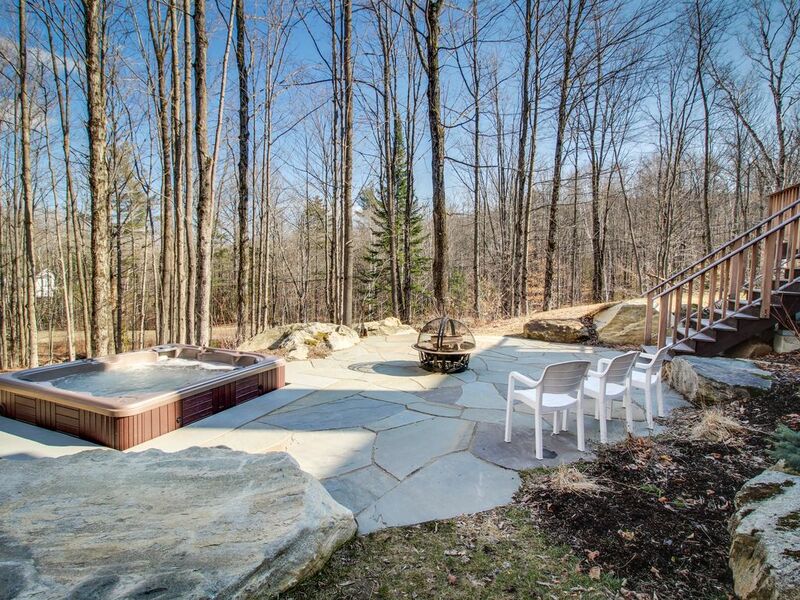 Your private hot tub is also a highlight - spend your evenings taking relaxing soaks and looking up at the stars. When you stay in this home, you'll be only minutes to wonderful skiing at mountain resorts. Grab your skis and snowboards and make the short drive to Stratton Mountain for some downhill action. You'll also be nearby plenty of opportunities to camp, fish, or hike in the Green Mountain State! Book now for the perfect Vermont getaway in a cozy and relaxing vacation rental! *Note that hot tub will only be available during the 5 month ski season (i.e. from mid November through mid April). The house is perfect— it is beautiful inside and out and fits all guests comfortably. 10 mins from grocery store, shops, restaurants, and Stratton mountain so make sure to grocery shop/ expect to do take-out if you order food. Most restaurants will not deliver to the house and there are not many available Ubers. Everything about this place is great! Definitely will be going back! This place was absolutely perfect. Several bedrooms, bathrooms and space. Hot Tub! Stay Here! Beautiful home. Cozy fireplace. Great location. Close to attractions. Well worth it! The home was not clean upon arrival. We were locked at for 45 minutes. There are a few minor maintenance issues. It did get cleaned and we were able to enjoy our stay. Lovely home.perfect time if year to visit. We thank this guest for their feedback. We will have the local property manager look into the maintenance issues. We do apologize for the housekeeping delay. We hope to be able to host this guest again at this lovky home.